The Zapatista Army of National Liberation (EZLN) launched the campaign, Against the Walls of Capital, earlier this year. The group, whose coffee we sell at Organiclea to support their liberation struggle, called on supporters all over the world to “organize with autonomy, to resist and to rebel against persecutions, arrests and deportations” because “every human being has the right to a free and dignified existence in the place that seems best to them, and they have the right to fight to remain there.” The Zapatistas’ call was made in response to Trump’s proposal for a massive border wall with Mexico, but their campaign expands far beyond the borders of the USA. Walls – physical, legal and psychological – are being erected all over the UK, Europe and beyond. The community food movement has a role to play in this campaign, and many of us are already playing our part in various ways. There is clear alignment between the goals of community food movement and the Zapatistas’ ‘Anti Wall’ campaign. As set out in the Community Food Growers Network manifesto, we believe in community development and social cohesion, in creating vibrant spaces for diverse individuals and communities to meet on a level playing field with the common goal of food. Many projects explicitly state on their websites that they aim to create inclusive spaces, to work with all sections of our communities and to foster solidarity and co-operation. In a society where the political establishment is bent on creating a ‘hostile environment’ for migrants, this radical inclusivity in itself can be a powerful form of solidarity. Not only do we welcome all people in our community, but we particularly value marginalised people. As noted on the May Project Gardens website, sustainable and ethical solutions can only come from drawing on and working with the marginal – both in terms of people and places. Right now migrants, and particularly those without secure immigration status, are amongst the most marginalised groups in society. Organiclea has supported migrants to volunteer with us, and a member of the co-op has supported applications for secure status to remain. This was important to us as a workers’ co-op, because we believe in social justice and are opposed to discrimination of all kinds. We apply the same principles in our interactions with people as when we are tending the land. In people as in plants, we know everything has value and we celebrate diversity. And just as in nature everything is interconnected, we believe that in the human community, a strong web of connections and relationships between all peoples is what keeps the system healthy and balanced. By building this kind of non-hierarchical community of self-reliance, we reduce dependence on exploitative structures and develop a secure base from which to challenge oppression and injustice. There are many migrants in London and the UK living precariously, both in terms of poverty and immigration status, and community projects have been set up all over to address this need. But it’s still not enough. One such example from the growing movement is the Mulberry Tree Community Garden, a Quaker project in Tottenham, which specifically welcomes migrants. Such projects promote community harmony and can be a safe space away from the hostile spaces enforced by the State. As community food projects we are committed to promoting and implementing food sovereignty. Food sovereignty is a political concept: it is about taking back control of our food system at every level. 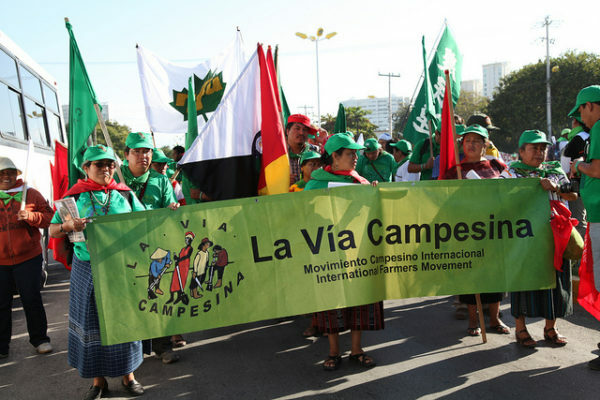 The concept was put forward by La Via Campesina and small food producers largely in the Global South. Globally, small food producers are marginalised and exploited. Both in the UK and abroad, migrants working in agriculture, food processing and catering experience out of control levels of exploitation. The food sector is well-known for its use of slaves, and this is a problem in the UK not just abroad. This is the human price of cheap food sold in supermarkets. Commitment to food sovereignty implies supporting people in their struggle to live a decent, autonomous life in spite of the humiliations imposed by neoliberalism. And we provide this support in the context of our work, in the gardens and in all our interactions with migrants. It was affirmed at the most recent CFGN gathering at Grow Heathrow that we want to maintain our radical edge and participate in direct action – where there is capacity and on issues relevant to our work. This could include issuing solidarity statements of our own. There is little reporting in the mainstream media on the injustices faced by migrants – or worse – where migrants are discussed, they can actually be demonised. By issuing a solidarity statement we can help make visible some of the ‘invisible’ injustices faced by the migrant community, and be a voice for our comrades in LVC at the London level.